KNOXVILLE, Tenn.--(BUSINESS WIRE)-- Hundreds of Ross University School of Medicine (RUSM) faculty, students, colleagues, alumni, and distinguished guests gathered October 20 in Knoxville, Tenn., for the medical school’s inaugural convocation ceremony. The ceremony provided a forum to recognize faculty and staff for driving RUSM’s extraordinary past successes and future opportunities. During the convocation, members of RUSM’s leadership team and representatives from the RUSM Board of Trustees addressed the audience. To recognize and honor some of the most esteemed faculty at RUSM, the inaugural Class of RUSM Master Educators was installed during the convocation ceremony. The goal of the RUSM Master Educators Guild is to recognize those faculty members who, by their actions and behaviors, advance RUSM’s commitment to excellence in medical education. The honorees are Dr. Enrique Fernandez, professor and chair Family Medicine; Dr. Laura Welke, assistant dean, Medical Sciences Faculty Affairs & Development, professor, Anatomy & Neurobiology, Department of Medical Foundations; and Dr. Nancy Selfridge, professor and chair, Clinical Foundations. 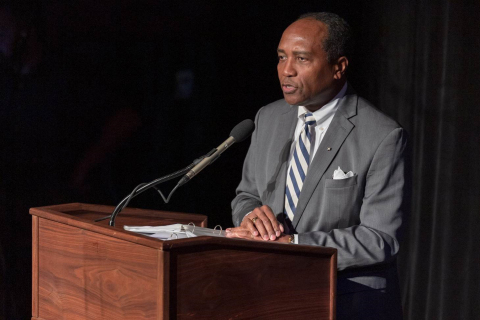 Additionally, renowned Dr. Griffin P. Rodgers, director of the National Institute of Diabetes and Digestive and Kidney Diseases, delivered the keynote address for the Convocation. As a research investigator, Dr. Rodgers is widely recognized for his contributions to the development of the first effective and now FDA-approved treatment for sickle cell anemia. Dr. Rodgers is a recipient of the recently announced Association of American Medical Colleges (AAMC) 2018 Herbert W. Nickens Award, given to an individual who has made outstanding contributions to promoting justice in medical education and health care equity in the U.S.
RUSM medical students relocated temporarily to Knoxville to continue their program of study on the campus of Lincoln Memorial University (LMU) after Hurricane Maria damaged the medical school’s campus in September 2017. RUSM has continued to use its own medical sciences curriculum and faculty while making use of the LMU teaching and office facilities. RUSM will permanently relocate to its new Barbados campus in January 2019. RUSM plans to make the convocation ceremony an annual event each fall. Ross University School of Medicine is a member of Adtalem Global Education (NYSE: ATGE), a global education provider headquartered in the United States. The organization's purpose is to empower students to achieve their goals, find success and make inspiring contributions to our global community. Founded in 1978, RUSM is committed to educating a diverse group of skilled physicians to serve as healthcare leaders. With more than 14,000 alumni, RUSM is an important contributor to healthcare in North America. RUSM is accredited by the Caribbean Accreditation Authority for Education in Medicine and Other Health Professions (CAAM-HP). For more information, please visit www.medical.rossu.edu. The purpose of Adtalem Global Education is to empower students to achieve their goals, find success, and make inspiring contributions to our global community. Adtalem Global Education Inc. (NYSE: ATGE; member S&P MidCap 400 Index) is a leading global education provider and the parent organization of Adtalem Educacional do Brasil, American University of the Caribbean School of Medicine, Association of Certified Anti-Money Laundering Specialists, Becker Professional Education, Carrington College, Chamberlain University, DeVry University and its Keller Graduate School of Management, EduPristine, Ross University School of Medicine and Ross University School of Veterinary Medicine. For more information, please visit adtalem.com.